The first day of my 12 days of crazy is over. And it is was worst day – the longest driving day. I took Elvis and Cilla to the vet this morning. Can’t believe I’m not going to see them for 12 days! I left at 8:20am and 8 hours 40 minutes later (568 miles) I’m in Wytheville, Virginia. It’s 55 degrees and it was 77 when I left Memphis. I’m freezing – and in shorts. It was a horrible drive – rain from Nashville to here. A pouring, steady rain and it was foggy and hard to see. Today was a great day! I left Wytheville at 7:45am and got to Cindy’s before 12:30. It was so much fun playing with Tabitha and Keira. I’m glad they remember me and are excited to see me. We had Ledo’s pizza and Cindy made me cupcakes for my birthday and gave me presents. We watched football and hung out until after 5. Then I went home and saw Mom and Dad, but then we went immediately to Jilly’s to eat and watch football. Denver 3-0! Then we stopped by Mike’s house to get the Vegas U2 tickets. Then came home and I got my presents from Mom and Dad. We watched tv until now. Great day! Another great day. Mom, Cindy, Kathy and I went to Charlestown Casino. I only lost $100 and we were there from 10:30 to 4:30. I played a lot of new games. 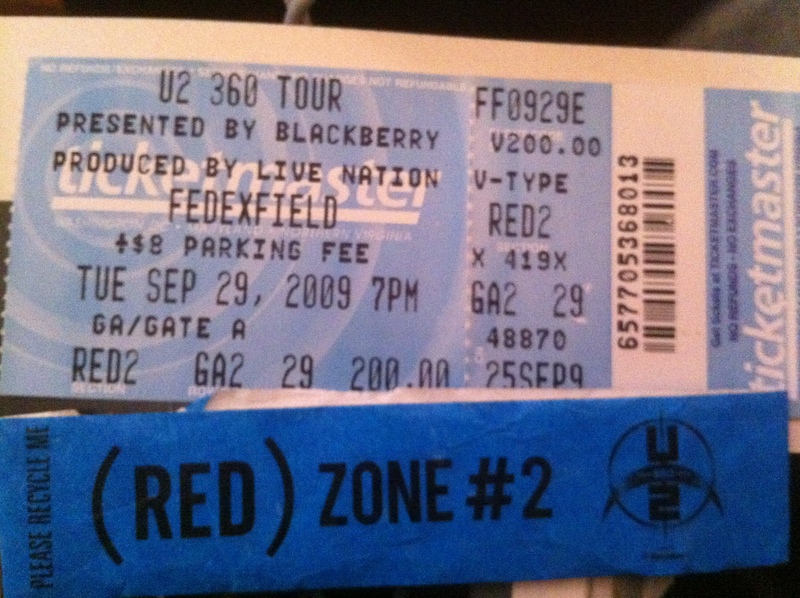 After we got home Kelly Brewer came over to buy my extra U2 DC ticket. It was great to see him again. Mom, Dad and I watched the sit coms tonight. 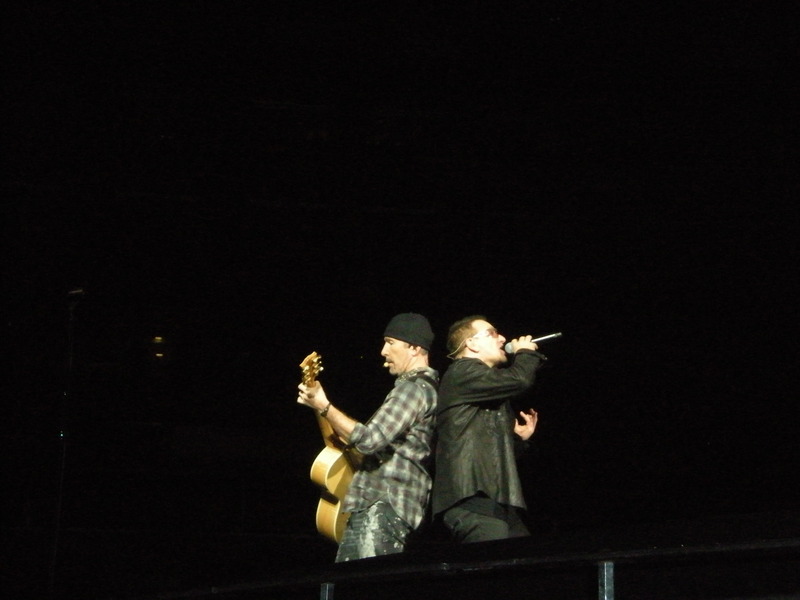 Tomorrow starts the week of U2 – 4 shows in 7 days. I’m going to be SO tired, and I already feel like I’m getting sick. Hopefully not. Today started with me waking up at 5am for no reason. I left the house at 2pm, was parked at FedEx Field by 3, said Hi to Jennifer in the GA line, got my red zone ticket from Shannon, and was in the red zone line by 3:30. I was about 10th in line. Kelly Brewer came and stood with me and we talked. Then they split the line into boys and girls to search us. 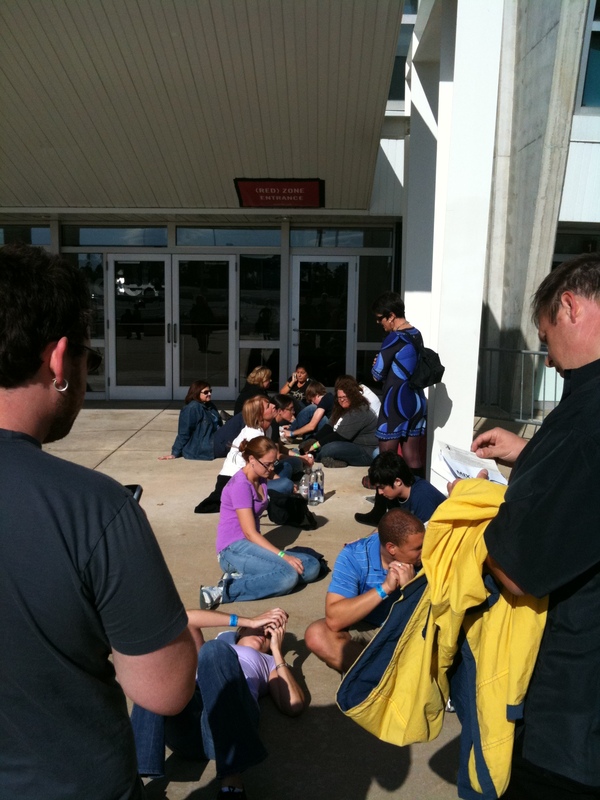 They let us in around 5:15 when everyone else went in, but no one told us where to go. We weren’t at field level. It took forever to get down there. Instead of going into the designated Red Zone, I went inside the circle on the front rail in front of Adam. I had my doubts that the stage was too high and I wouldn’t be able to see that well, but it turned out to be a blast and my favorite show so far this tour (better than Chicago). 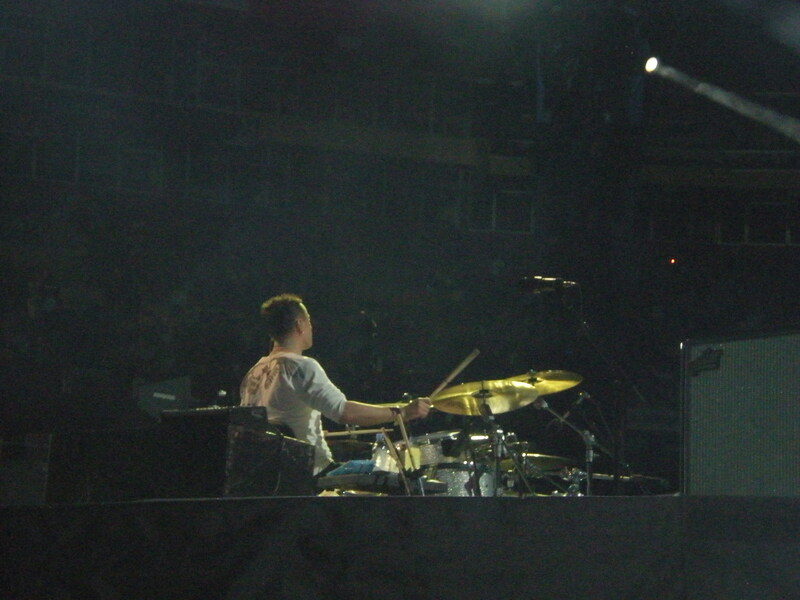 Muse opened. There were ok. I see them 3 more times, so I’ll form an opinion later. There was no No Line on the Horizon or Unknown Caller and of course no Bad or Pride. 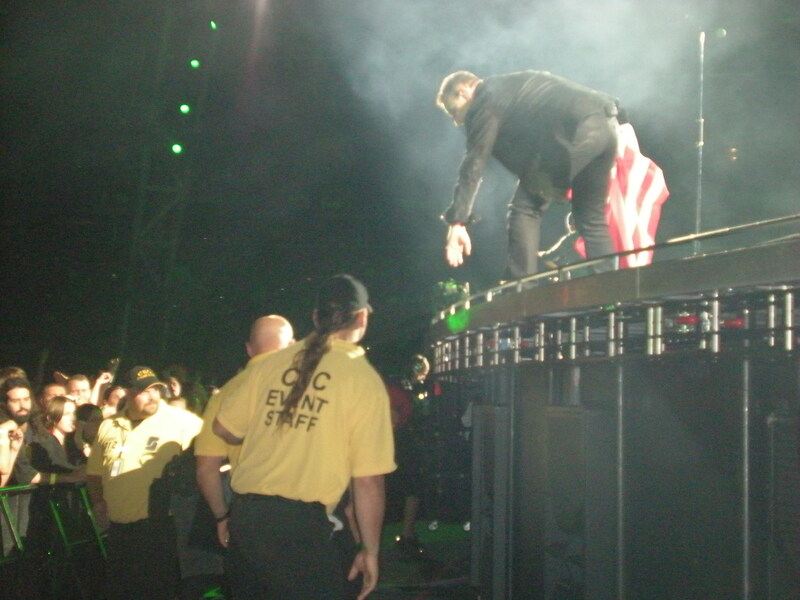 During City of Blinding Lights, Bono brought up a kid on the catwalk and ran around with him then gave him his glasses. 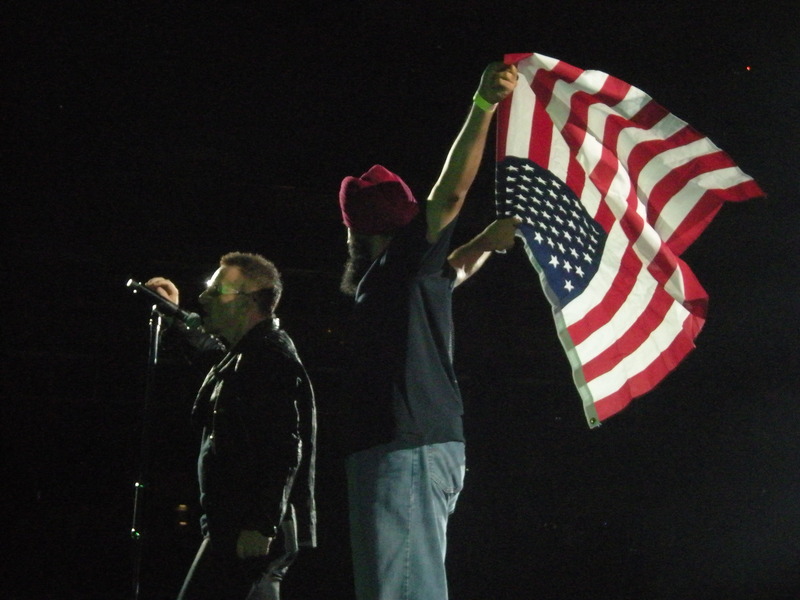 During Sunday Bloody Sunday, Bono pulled this guy up on stage who was standing not too far from me holding an American flag. They sang and hugged. Apparently many politicians were at the show. I saw lots of security. 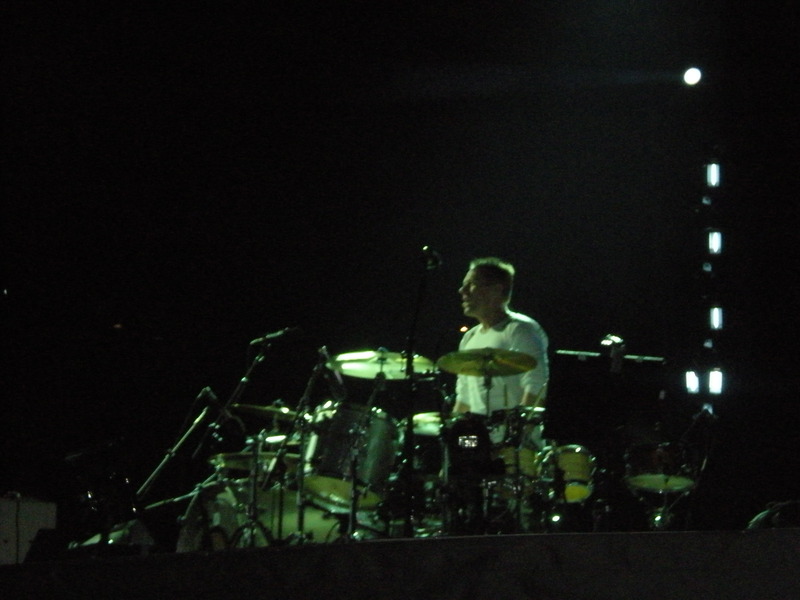 My favorite part of the show was when Larry saw my Larry Mullen Band shirt and smiled and nodded. 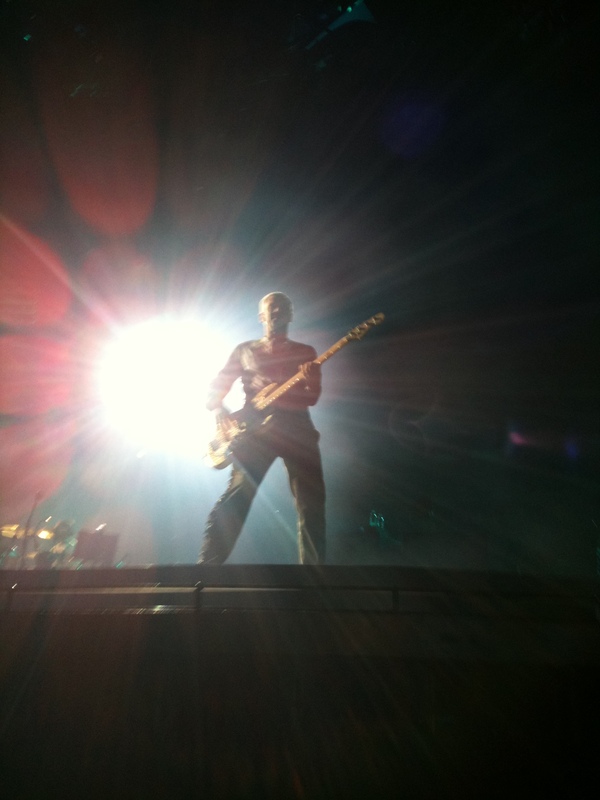 I was taking a picture of Adam for Tasha with the bright light behind him so he looked almsot angelic. The bright light was on Adam and I was right in front of Adam so the light was on me. Larry was turning around to face the back for Beautiful Day. And as he was turning, I started jumping and screaming and that’s when he saw me. A girl 2 people down came up to me after the show and said, ‘I saw Larry smile at you.’ AAAHHHH!!!! Great show! I’m standing rail again! LET ME IN THE SOUND! is adam a bit confused? 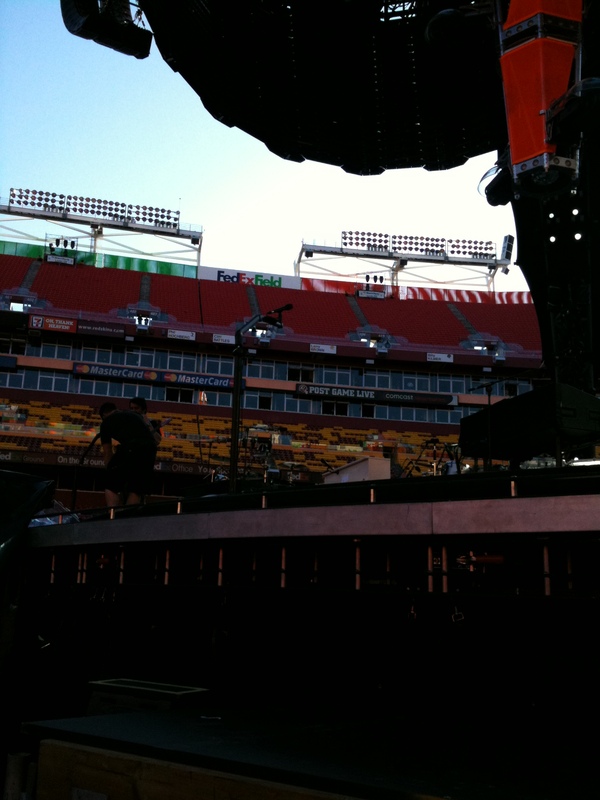 The DC show was my closest, most centered spot of the tour. DC is still one of my favorite shows of the tour. Even though it didn’t have the best set list, there was a great energy from the band and the crowd. And it didn’t hurt that Larry noticed me and smiled, although he did that a few other times along the tour, but this was the first. 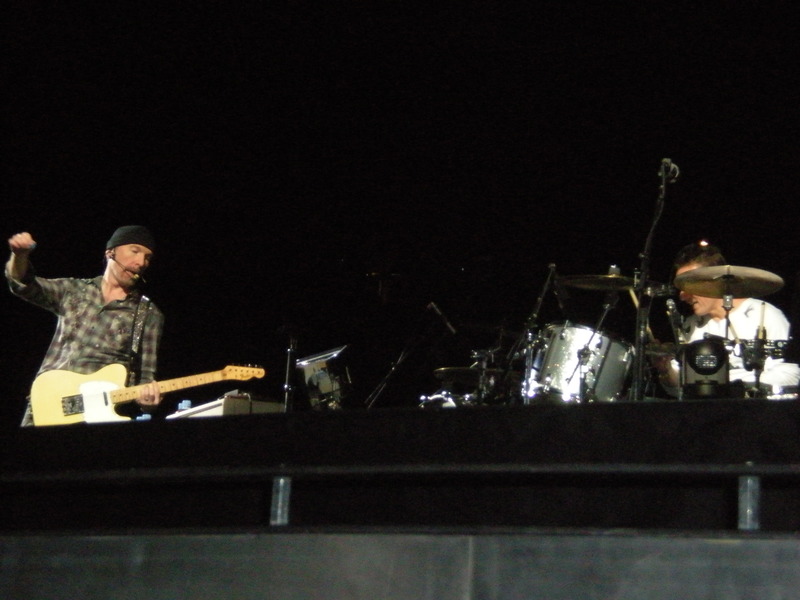 The guy pulled up on stage happened to be friends with a lot of my U2 friends. 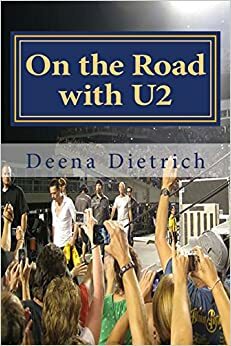 And the kid getting bono’s glasses during City of Blinding Lights happened at most shows, but this was the first time I saw it so I thought it was cool. 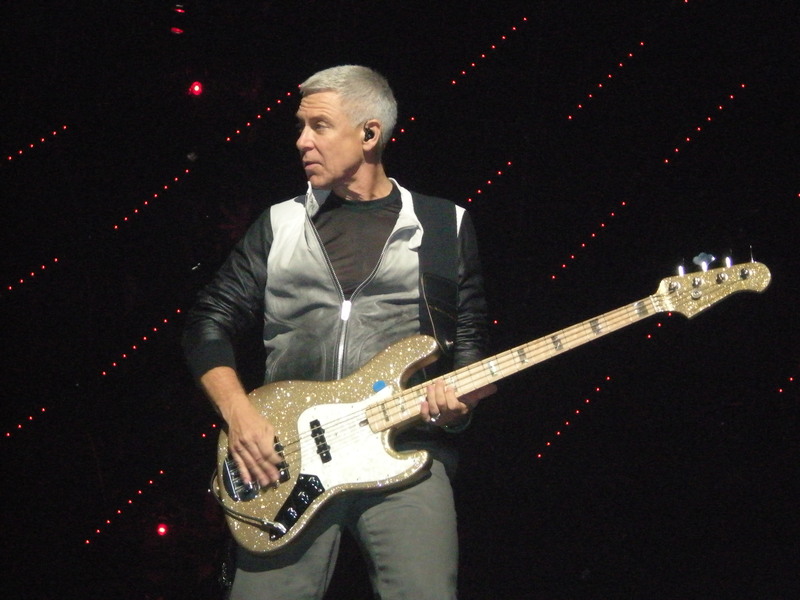 If you want to see all of my pictures from that DC show please click http://www.facebook.com/album.php?aid=111193&id=734599167&l=e44e835afd or the link on the right of my homepage for 360 2009 pics.